A report from the State Farm Insurance company says the number of car-deer accidents in Iowa in the last five years have increased by 17-percent. Agent Kari Durham says that’s right up with the national average. She says nationwide there’s been an 18-percent increase in deer-vehicle collisions, and overall Iowa ranks fourth for number of accidents. Durham says the damage done to vehicles has increased too. Durham says the average property damage cost is about $3,050, which she says is also up from recent years. 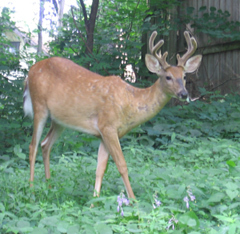 Durham says you can help avoid an unfortunate encounter with a deer by paying close attention in areas where they live. Durham says the deer crossing signs are placed in the areas where the animals are most active, and she says the active hours tend to be between six and nine p.m. She says you should use your high-beam lights when possible to illuminate more of the area and see the deer. And if you see and miss a deer, don’t think you’re home safe. Durham says deer generally travel together, so if you see one, there are generally others around. She reminds drivers that if you see a deer and can’t avoid it, it is best to hit the deer instead of swerving out of the way as that may cause you to lose control and hit another car. For the third year in a row, West Virginia tops the list of those states where a collision with a deer is most likely The likelihood of a specific vehicle striking a deer there is one in 78, compared to one in 104 in Iowa.